The Zoo is "Over the Moon" for its New Jellies! 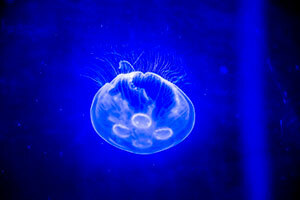 The Zoo is pleased to welcome moon jellies back to the Aquatic and Reptile Center! Before bringing in these new jellies, renovations needed to be made to their exhibit – including a redesigned filtration system. The Zoo currently has 13 jellies in the ARC, with 10 more on the way. Fun fact: a group of jellies is referred to as a smack, swarm or a bloom. Moon jellies, which have a relatively mild sting, are fed a varying diet that includes enriched brine shrimp. A fun thing for visitors to do is stop by and see the jellies right after their morning or afternoon feedings, as the shrimp they are fed are supplemented with nutrients that give off an orange hue. This causes the jellies’ digestive organs to glow a bright orange color, which can be seen through their translucent tissue. A laidback animal that tends to “go with the flow,” moon jellies are filter feeders that prefer open pelagic ocean waters with sparse vegetation, in which they can become entangled. As visitors to the Jelly Exhibit will see, plastic bags floating in the ocean look awfully similar to moon jellies and are often misidentified as such by turtles and other sea creatures that feed on jellies. Thinking they are jellies, sea turtles and other animals consume the plastic bags, leading to blockages of their digestive tracts and eventually death. This is one more reason why it is important to reduce use of plastic bags in order to keep them out of our oceans. Stop by the Aquatic and Reptile Center and check out these mesmerizing invertebrates on your next visit!